Of 17,000 calls up to 50% claimed their pets died. Pet food from 2006 tested positive for melamine. No samples available prior to that date. 2.7 million chickens ate tainted food. In addition, tainted pet food consumed by chickens in hundreds of farms. Will not give clear answer to whether people ate those chickens. No details given on investigation in China. Not even the number of investigators. Can’t rule out contamination in other vegetable protein. All tainted ingredients went to pet food companies. For the liveblog results, go here. P.S. 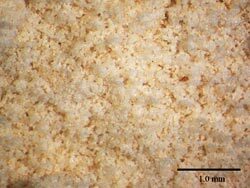 Want to know what melamine looks like in wheat gluten? See after the jump. This entry was posted on Thursday, May 3rd, 2007 at 5:18 pm	and is filed under Cats, Other Pets, Pet Food Recalls & Safety, Dogs, National Dog, Cat & Pet Info, News for Cats, Dogs & Owners, Products & Services for Cats & Dogs, Veterinary/Medical. You can follow any responses to this entry through the RSS 2.0 feed. Both comments and pings are currently closed. free of charge - just donate the product and i’m sure they wouldn’t say no. Monika thanks for the contact ! I’ll ask there. I hold the pouches, because they told us to feel sure with Nutro in Germany. But I couldn’t believe, it’s also manufactured by Menu Foods with wheat gluten. Just about 2, 3 weeks ago, Nutro Germany recalled all their pouches and cans, all dates “best for”. But there’s still rare media about the recall in our country. I’m happy, the pouches didn’t cause renal failure to my cats ! We stopped feeding Nutro, RC and Iams end of march, the day I found Itchmo, - thanks for this site. We hope, You’ve the possibility to keep Your pets save ! A friend of mine has a sick cat on a vet-prescribed canned food…..called to ask me about black flecks in the food. I told her to bring it back to the vet. I had heard other people talking about the canned food looking different before their animals got sick. Long story short, vet contacted company, they said it was burnt something or other…..I told her that was BS. Now I have printed that pic for her to take to her vet. Amazed her cat is still alive. It’s pretty sad when you can’t even consider the vet-prescribed diets safe. The rules for producing that food are a lot more stringent than for regular pet food…..so that tells you a lot. I fear for dry food, which is all I use for my dog…..I think the only “safe” (& I use that term loosely) dry food is one which is made in the company’s own facility. We have already heard about the manufacturers taking it upon themselves to add glutens when glutens were not part of the recipe. So now we’ll start hearing about “cross contamination” of dry food….if they’ll get real & fess up. My pooch gets a tad of dry & the rest made by her mommy, who loves her more than anything. She also gets a chewable multi-vitamin in case she isn’t getting all her nutrients. Don’t know what else to do. Had no idea Nutro made it all the way to Germany. I wonder how many of the Menu Foods products were shipped out to markets all over the world and if those markets are even aware. Incredible. I also hope they test negative. Unfortunately, I’m coming to conclude that vets know little to nothing about small animal nutrition except what they learn from the pet food manufacturers. In addition, they get a residual on all the pet food they sell. Not likely to be very unbiased people if you ask me. Finally, everytime I have ever had a sick dog or cat (for whatever reason), they have put my animals on boiled chicken and rice diets - why resort to human food for recovery if it were so unhealthy or incomplete nutritionally? The mail’s gone to Guelph. I’ll tell You the answer. I would wish, they are negative, but I don’t think so. Melamine to push protein seems to have a long, long pratice :-(, why should these pouches be clean ? Anyone heard anything at all negative about Innova Evo or Honest Kitchen dehydrated raw? Those are the only two foods I will feed right now, mixed half and half with raw and home cooked foods. I haven’t heard anything bad, and I believe (according to what they say) that they produce their own foods. I know the Honest Kitchen stuff is made in a USDA plant that makes human foods. I am using the grain-free varities. Still……it makes you wonder. Honest kitchen told me that they only use fit for consumption protein - no 4D animal and no rendered animal. Hopefully, they are not lying. Pure melamine is white crystal. The particles in the pictures are dark which proves they are scrap by product full of who knows what. Cyanuric acid is also a white crystal. 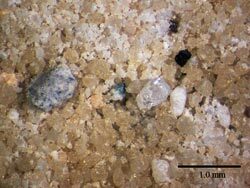 If there are that many dark colored particles in the mix to the naked eye the mix would look darker. The larger number dead is probably still not large enough. Everyone I know seems to know someone who lost a pet. Unless our region is exceptional that would mean huge numbers. And the FDA is only covering reported deaths. in this bad economy many cannot afford a vet. Most do not call the FDA. 1. do you have a sick or dead pet? 2. Do you know someone with sick or dead pets? 3. What were you feeding them? I blame Wal-Mart as the originator of this problem. They have devastated so many US companies by sourcing their junk in China, getting around much government oversight over the production process. Other countries immediately ban imports from the US if there’s even a hint of a problem, why isn’t the US government simply banning imports of food ingredients from other countries that have a history of improprieties, and can’t possibly meet US standards? All of Our Service Men and their Families buying Food at a Base Commissary. It’s mostly “American” brands at them. They Live on Foreign soils. I have No idea on how we could handle such a Notification but doubt, there has been Any, for the Military/Service section of “our” population. Does Anyone here have Any ideas or Connections or “family” yet in the Service and “overseas”, living there??? Any BBoard you might have connections to? Can you Post Alerts there? These families certainly would not be able to afford, a pet sick, in the manners we’ve endured here. KIKI - my sister is a vet and unless they specialize in animal nutrition post-graduation, very little is taught about nutrition overall. I am lucky, I have a vet with a subspecialty in exotics and his nutrition knowledge seems better than most vets I know. The vast majority of my sister’s nutritional education came from the food companies. You have to find a vet with a specialty in nutrition to get the best answers. Anyhow, this is the letter I just sent to Diamond foods. Several of us decided to give them a chance as we were running out of foods locally and had to feed something to our pets. The prices on the super premium stuff is being jacked up locally! With all the food I go through between my own pets (and a small colony of feral cats we altered, vaccinated and are managing), this price jacking hurts. But I hated what I saw… Generally my critters are OK with food changes. All have cast iron tumiies I think - even my pancreatitis dog! I like to give a week to ten days if possible, with my dogs, not an option - I had to do within a couple days. The food I was feeding had formulas being recalled and I was worried about what I was feeding for dry (it has gluten and not sure if it was imported or not). After quite a bit of researching foods for my pets and in light of the massive pet food recalls, I decided to try your products, for various reasons. Sadly, I was not pleased with the results I saw. First let me state I have six indoor cats and four dogs. I saw issues in all of my pets that concerned me. There were no changes in environment, treats or medications that could caused the issues. The only new element in the lives of my pets was the food. The foods were fed for approximately 8 weeks. With the cats, I did a very gradual change (a week). The dogs had a slight quicker change (several days), as I was worried about the current food they were eating in light of the recalls. Increase in vomiting of un-digested to partially digested food (several times a day); increase in litter box use (feces) and larger, more odiferous stool. Within a day of being on the food completely I was seeing: larger, darker, more odiferous stool; significant increase in soft stool in two dogs; significant increase in the eating of grass (to the point of the grass being very visible in the stool), significant increase of the eating of feces in all of my dogs, weight gain in a dog who is on half rations, and excessive flatulence in two dogs. Therefore, I am no longer going to be feeding your products. I observed negative changes in all ten of the animals fed Diamond foods for over a two-month period. Not one adjusted to being able to eat your foods. Were did you find information on Life’s Abundance, that they use menu foods? I didn’t see that on the web site or maybe I missed it. I lost my baby girl, Sadie, a six year old cat, in September of 2005 to acute renal failure. I had been feeding my two cats Nutro exclusively for a couple of years prior. I primarily fed them dry food with occasional treats of the pouched food which was later recalled. Now I wonder if I poisoned my little girl with what I thought to be safe and nutritious food. After Sadie’s passing, I fed my then four year old, Petey, exclusively dry Nutro indoor cat formula. Within four months he began increasingly agitated and neurotic. He started urinating more frequentlly, increasing to every few minutes, straining and obviously in pain. I had him tested by two different vets for infection, crystals and any other health condition that would cause his problems. The tests were always negative. We had to begin sedating him, and he is still on a mild sedative, given every two days. He would still have occasional bouts with urinary tract “irritation,” but both vets told me that the condition was entirely behavioral and neurological. After news broke of the pet food recalls, I decided to switch Petey to Solid Gold products. He immediately enhaled the first serving and has been in love with the foods ever since, even taking to begging for more. I have seen a marked improvement in his disposition. He is more loving (like his old nature) and wants to spend more “quality time” with myself and my husband. I will continue to closely monitor him, and hope to be able to wean him off of the sedatives soon. I cannot say for sure that his health and temperament issues were a direct result of issues with Nutro foods. The last I checked, the dry indoor formula was not a part of the recall. However, I am amazed at the change in my pet and am hopeful that he will continue to improve. I would love to hear from anyone who has had a similar experience. Sorry to hear about the passing of your kitty. We all didn’t know this was going on for so long. We thought we were buying the best food for our babies because we trusted what the co. were telling us. It’s no ones fault but the companies. The ones I lost all had cancer and bowel disease. One was 14, one was 12 and the other was 17 but had problems his whole life. I also was thinking about Solid Gold. Did you use can food? If so, what flavor? What was the dry food also? I do have one now who is afraid of EVERYTHING. I can’t figure out what happened to her, but maybe it is the food. I would love to be able to till a similar experience! I also have Life’s Abundance. I know menu food does pkg. the can, but I thought since it was near them it would be fine. I have 4 cats. Two will taste a little, one will eat it if I put clam jiuce on it and the other big baby won’t eat it. What would you put on it to get yours to eat it? They all like the dry food, especially my smallest. I am still looking for that special food that I don’t have to be afraid of. I still have NB on hand for them so they do eat. so far, so good. I hate to have to watch them all the time to make sure they are alright. this is nuts! Petey loves, loves, loves the blended tuna. He’s still begging for it all day, every day. And he’s still a much happier cat overall than he was before I switched to Solid Gold. I feed him the lamb dry food…. I think it’s called Flocken or something like that. Those are the only flavors my store carries right now. Give them a try for a week or so and see if your kitty improves. I would love to hear that it works for you, too!